Hey, that title's not annoying at all, is it? 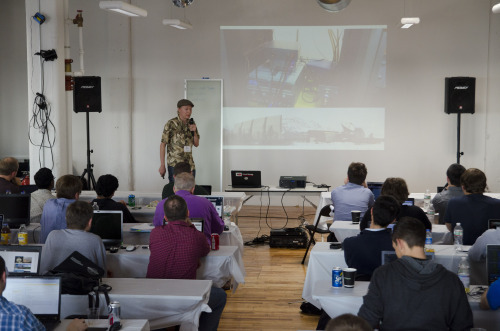 This post discusses our forum on Free and Open Source Software (FOSS) for Software Defined Radio (SDR) at the Wireless@VT (Virginia Tech) Symposium a couple of weeks ago. We brought together five speakers from different areas to talk about how FOSS works in their world of radio and SDR. I talked about the GNU Radio project, Philip Balister spoke on OpenEmbedded and how we use it for SDR development on embedded systems, Tim O'Shea from the Hume Center of Virginia Tech talked on their use of FOSS in research in both wireless and machine learning, Rick Mellendick from Signals Defense spoke about how FOSS has enabled work in wireless security and penetration testing, and Ben Hilburn from Ettus Research was there to speak about his perspectives on FOSS from an industry point of view. The main intent behind this tutorial was to expose the audience to a lot of projects and tools as well as ideas that the FOSS world can offer. The various perspectives on this were to showcase how wide-reaching FOSS is in technology, business, concepts, and intent. Essentially, we wanted to help add to the discussion about how the tools and technology can impact work in various fields. There is a lot of misunderstanding about FOSS in our world. In the world generally, sure, but I am specifically talking about wireless and signal processing where we are not brought up on open source. We see the misunderstanding as well as mistrust of it from traditional engineers and engineering. It is often seen as something that's fun as a toy or hobby, but not for real work. 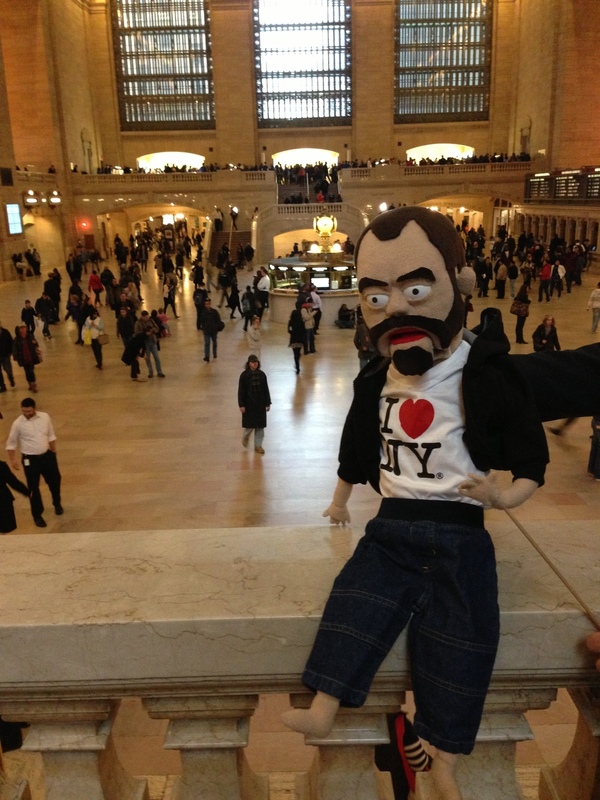 Plus the big question of monetization. In the five talks in the panel, I think we exposed a lot of powerful FOSS technology and projects as well as explained some of the behavior and philosophy of FOSS. You can download the presentations in the list of talks below. I also really want to apologize publicly again to Ben Hilburn for running out of time. I completely misjudged how much time we had available, but he's been gracious enough to provide his slides here. We have recently been working to support building and using static libraries for all GNU Radio components, which therefore means static libraries for our different dependencies as well. Part of this is to better support Android development work in GNU Radio, but there are other use-cases where people find it useful to build static applications for easier distribution and configuration control of systems. Whatever your feelings here, we want to support the capability. Ettus Research will soon be updating the UHD library to also support building and using static libraries, though there are a couple of caveats. First, I'll go over some of the issues with static libraries and what we've done in GNU Radio. I'll then introduce the way they have handled it in the UHD library, which leads to other issues with libraries, at least in Ubuntu due to some decisions they have made. We'll cover these issues and show how to get around them, at least for right now. As of the writing of this post, the static library support is not part of the mainline source code for UHD, so when I say "look at the UHD manual," I mean the future manual when they merge this concept into their distribution and release it in a future version. The difference is that when you call 'get_some_variable()' the first time, it will initialize the variable for us as a static variable. All calls after that will return the same static variable we have defined here. And then we jump through some hoops to provide access to the some_variable in another way -- like with a #define that maps to the call get_some_variable(). In GNU Radio, we have been patching it to remove any direct calls to global variables using the above method. Doing so makes it possible to build and use a libgnuradio-<component>.a file to build statically-built applications. We've supported the building of static libraries in GNU Radio for a while, now, by using the -DENABLE_STATIC_LIBS=True as a CMake argument. When this flag is enabled, we build both the shared and static libraries. So, for instance, we will build a libgnuradio-runtime.so and libgnuradio-runtime.a. However, we do not build static versions of gr-fcd or gr-uhd because of underlying problems with the hardware libraries themselves. We did not have a static library for libuhd.a that we could use in order to statically link with libgnuradio-uhd.a. So we kept those disabled during the static library build. Working with Ettus Research, they have added their own -DENABLE_STATIC_LIBS flag when building libuhd. This is a big help to us as we can now enable static libraries for gr-uhd. However, this one comes with a bit of a caveat and the reason for this post. LibUHD still uses static globals like I discussed above. Some of these are tied pretty tightly into the code, and so the task of updating the code is a bit more difficult. At least here, though, we have another way around it, and I felt it was worth publishing the way to handle it here. The short of it is the use of the -whole-archive flag to the linker for libuhd. On Ubuntu, the second problem is difficult because we need libusb-1.0, which in turns relies on libudev. Ok fine, so we'll install libusb-dev and libudev-dev, which install both the headers and static libraries on Debian/Ubuntu systems. Oh, but wait, no it doesn't. Fairly recently, the libudev-dev install no longer installs libudev.a. You can search for this and find various questions about where libudev.a is and how to install it in Ubuntu, and you'll see them mention something about no longer supporting it because "why" and if you do you're "doing it wrong." Ok, awesome. But we still need it if we want to use libuhd.a even if we aren't using a USB-connected USRP. Luckily, it turns out that installing udev's static library on Ubuntu isn't that bad, at least not as of 14.04. Here's how you do it. Ubuntu 14.04 uses version 204, so get that tarball. Make sure you set a good prefix and not /usr since we probably don't want to overwrite the any libraries installed by apt-get. There should be a way to just build libudev.a and not all the systemd stuff as well, but that way seems to be mysterious. Neither --enable-udev-only nor --disable-systemd seem to work right. Make sure that you don't run this as sudo! Make the install prefix writable by you as a user. The build system will try to do stuff in /usr/lib/systemd regardless of what prefix you set. But just running 'make install' will install the libraries into your prefix and then error out when trying to do stuff in /usr/lib. Don't worry, everything you need is installed where you need it. This builds a C++ example that I called gr_uhd_test that creates a GNU Radio application, so I have to link against all of the appropriate GNU Radio libraries as well as libuhd.a using the whole archive flags. I also needed to include all of these Boost libraries, liborc, libusb-1.0 and libudev as discussed, the logging library liblog4cpp, and some system libraries for pthread, dynamic linking, and realtime support. I wanted to have all of this information chronicled somewhere, partly so that I don't forget it later in life. Hopefully, this will help understand some of these issues and help us build static applications, at least under Ubuntu with the libudev.a problem. On a side note, it sounds like CentOS does not have this problem. One of the other nice things that Martin did when adding static library support to libuhd was also provide CMake settings that we can use. Again, take a look at the UHD manual for building static library support and it will show you how to set up your CMake project to properly link in the static libuhd. Part of this is that they set the -whole-archive and -no-whole-archive for us, so it does the right thing without us having to know what and why. I wanted to write this post so that we both know why and have some idea of what to do if we run into problems with requiring these other libraries, like libusb and libudev. I just pushed to our GNU Radio master branch an update that allows us to set a few new build types. With our work in optimization, profiling, VOLK SIMD work, etc. etc., I added new build types to make setting up different testing scenarios a little easier by specifying the CMAKE_BUILD_TYPE. NoOptWithASM: sets '-g -O0 -save-temps' to add debug symbols, do no compiler optimization, and save all temporary build files, including the assembly .s files. This allows us to study the assembly output when using VOLK with SIMD intrinsics to make sure we're doing "the right thing." O2WithASM: sets '-g -O2 -save-temps' to also keep the assembly files but do some compiler optimization. O3WithASM: sets '-g -O3 -save-temps' to add the next stage of compiler optimization. There are the cmake default build types that are always available: None, Debug, Release, RelWithDebInfo, and MinSizeRel. So each stage of optimization shaves off some time. Of course, there's a lot of time taken here in the setup and tear down of each test. These numbers let us know that, sure, optimization is better, but why would anyone be surprised? Hopefully, no one. I just used this as a way to test that each build profile worked right and did what it was supposed to. I figured I might as well put the numbers out there, anyways, since I had them. I've talked in various presentations about the merits of fast convolution, which we implement in GNU Radio as the fft_filter. When you have enough taps in your filter, and this is architecture dependent, it is computationally cheaper to use the fft_filter over the normal fir_filters. The cross-over point tends to be somewhere between 10 and 30 taps depending on your machine. On my AVX-enabled system, it's down around 10 taps. However, Sylvain Munaut pointed out decreasing performance of the FFT filters over normal FIR filters when decimating a high rates. The cause was pretty obvious. 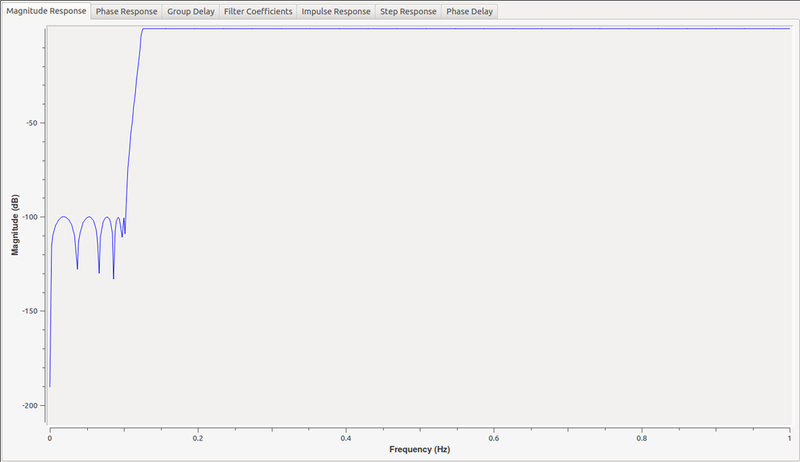 In the FIR filter, we use a polyphase implementation where we downsample the input before filtering. However, in the FFT filter's overlap-and-save algorithm, we filter the input first and then downsample on the output, which means we're always running the FFT filter at full rate regardless of how much or little data we're actually getting out of it. 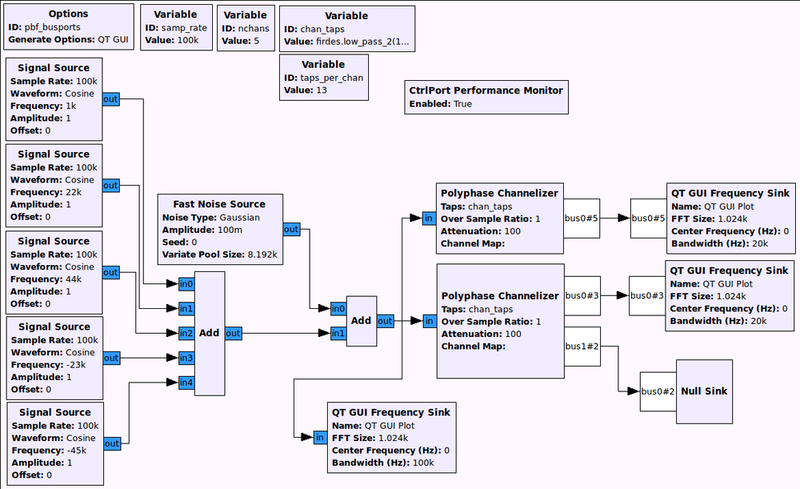 GNU Radio also has a pfb_decimator block that works as a down-sampling filter and also does channel selection. 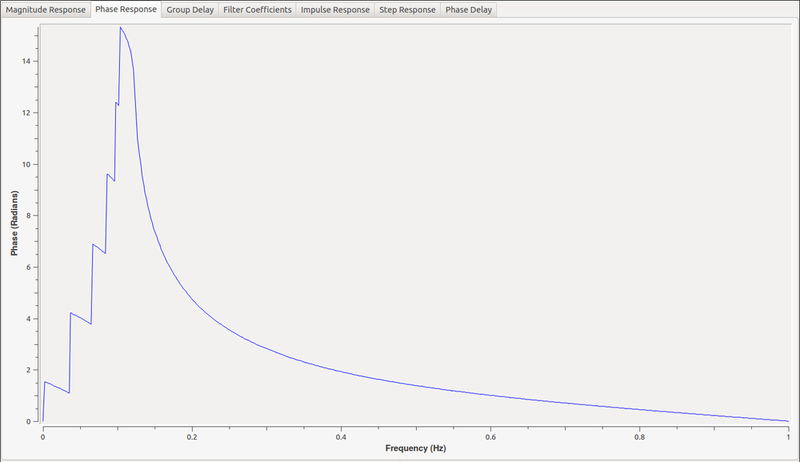 Like the FIR filter, this uses the concept of polyphase filtering and has the same efficiencies from that perspective. The difference is that the FIR filter will only give you the baseband channel out while this PFB filter allows us to select any one of the Nyquist zone channels to extract. It does so by multiplying each arm of the filterbank by a complex exponential that constructively sums all of the aliases from our desired channel together while destructively cancelling the rest. After the discussion about the FIR vs. FFT implementation, I went into the guts of the PFB decimating filter to work on two things. First, the internal filters in the filterbank could be done using either normal FIR filter kernels or FFT filter kernels. Likewise, the complex exponential rotation can be realized by simply multiplying each channel with a complex number and summing the results, or it could be accomplished using an FFT. I wanted to know which implementations were better. This means we get to pick the best combination of methods depending on whatever influences we might have on how each performs. Typically, given an architecture, we'll have to play with this to understand the trade-offs based on the amount of decimation and size of the filters. I created a script that uses our Performance Counters to give us the total time spent in the work function of each of these filters given the same input data and taps. It runs through a large number of situations for different number of channels (or decimation) and different number of taps per channel (the total filter size is really the taps len times the number of channels). Here I'll show just a handful of results to give an idea what the trade-off space looks like for the given processor I tested on (Intel i7-2620M @ 2.7 GHz, dual core with hyper threading; 8 GB DDR3 RAM). This used GNU Radio 3.7.3 (not released, yet) with GCC 4.8.1 using the build type RelWithDebInfo (release mode for full optimization that also includes debug symbols). 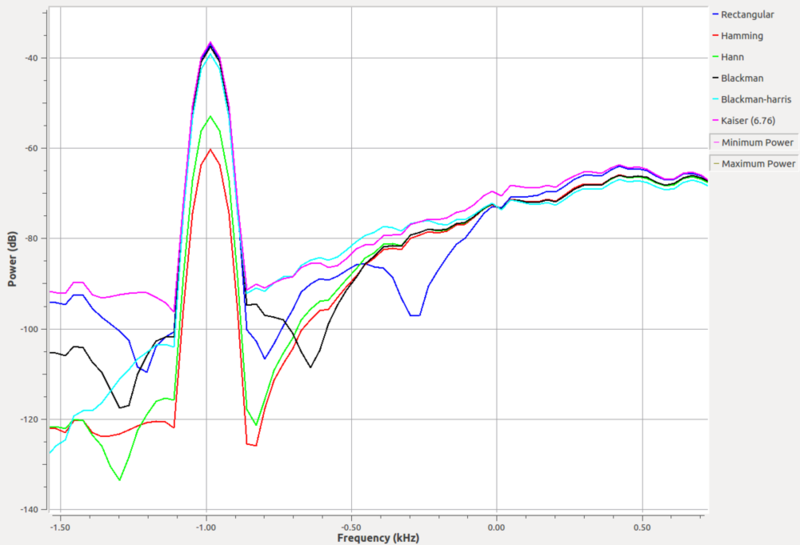 Here are a few select graphs from the data I collected for various numbers of channels and filter sizes. Note that the FFT filter is not always represented. For some reason that I haven't nailed down, yet, the timing information for the FFT filters was bogus for large filters, so I removed it entirely. Yet, I was able to independently test the FFT filters for different situations like those here and they performed fine; not sure why the timing was failing in these tests. We see that the FIR filters and FFT filters almost always win out, but they are doing far fewer operations. 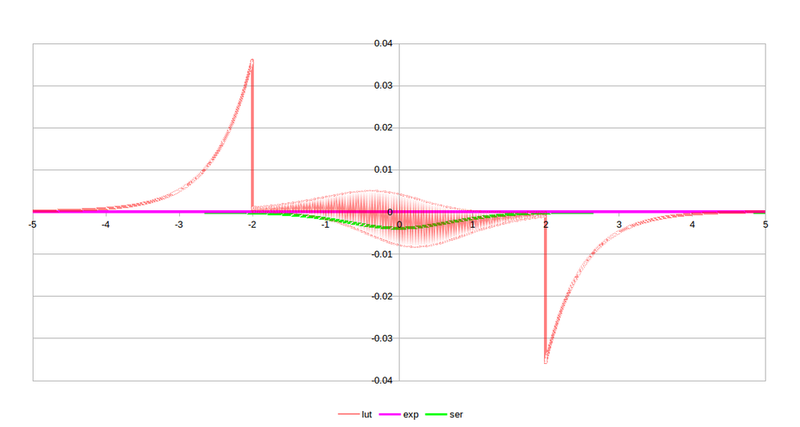 The PFB decimator is going through the rotation stage, so of course it will never be as fast as the normal FIR filter. But within the space of the PFB decimating filters, we see that generally the FFT filter version is better while the selection between the exponential rotator and FFT rotator is not as clear-cut. 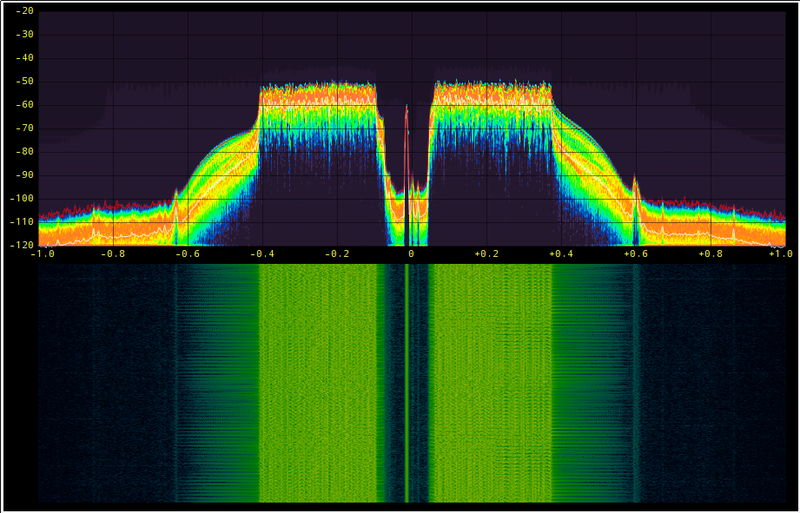 Sometimes one is better than the other, which I am assuming is due to different performance levels of the FFT for a given number of channels. You can see the full data set here in OpenOffice format. A second script looks at a more interesting scenario where the PFB decimator might be useful over the FIR filter. 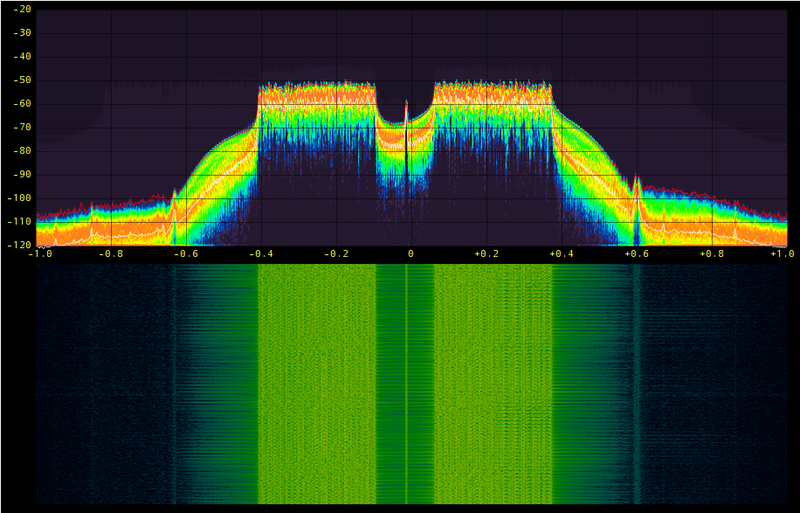 Here, instead of just taking the baseband channel, we use the ability of the PFB decimator to select any given channel. To duplicate this result, the input to the FIR filter must first be shifted in frequency to baseband the correct channel and then filtered. To do this, we add a signal generator and complex multiply block to handle the frequency shift, so the resulting time value displayed here is the sum of the time spent in each of those blocks. The same is true for the FFT filters. Finally, we add another block to the experiment. 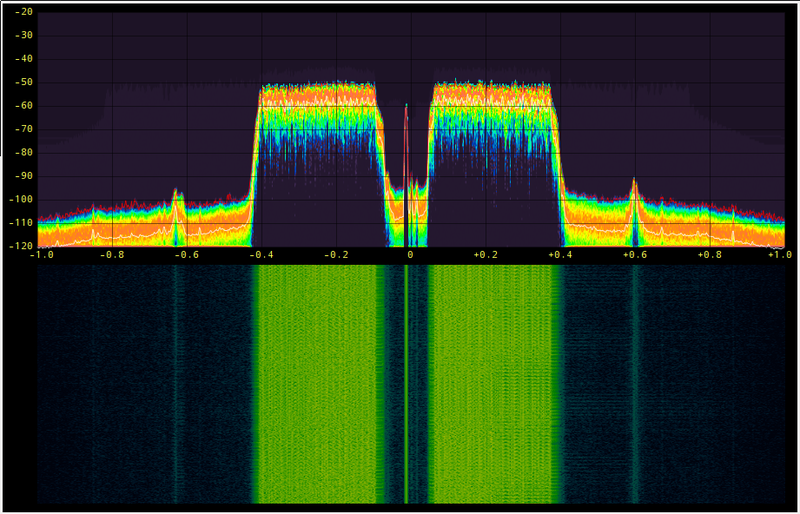 We have a freq_xlating_fir_filter that does the frequency translation, filtering, and decimation all in one block. So we can compare all these methods to see how each stacks up. 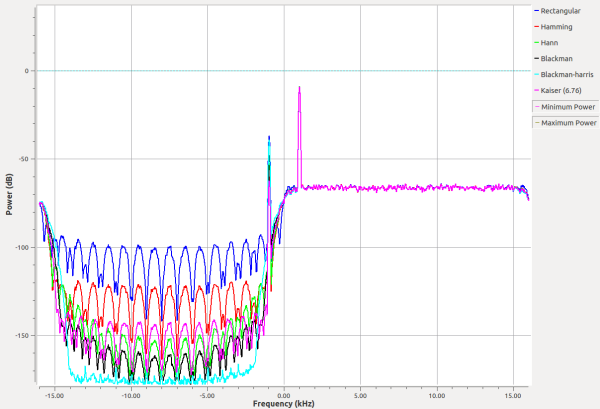 What this tells us is that the standard method of down shifting a signal and filtering it is not the optimal choice. However, the best selection of filter technique really depends on the number of channels (e.g., the decimation factor) and the number of taps in the filter. 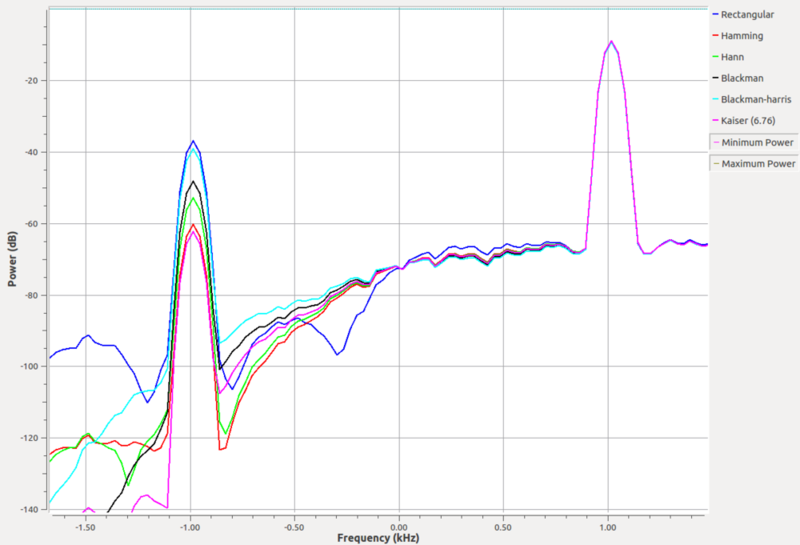 For large channels and taps, the FFT/FFT version of the PFB decimating filter is the best here, but there are times when the frequency xlating filter is really the best choice. 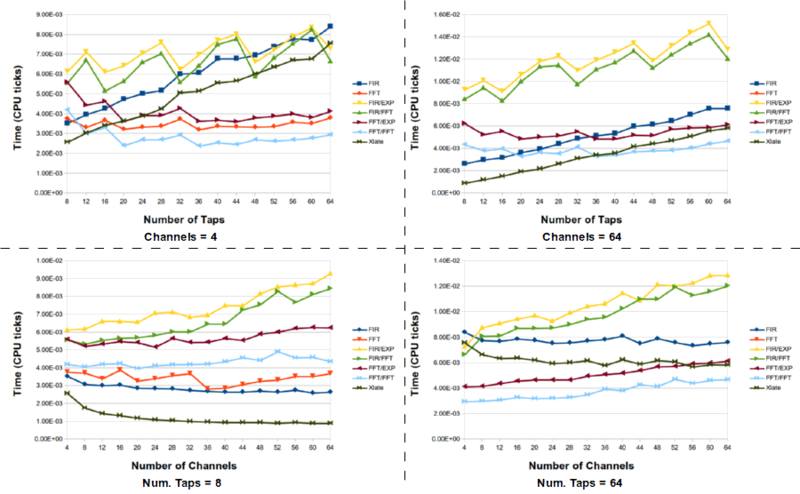 Here is the full data set for the channelizing experiments. 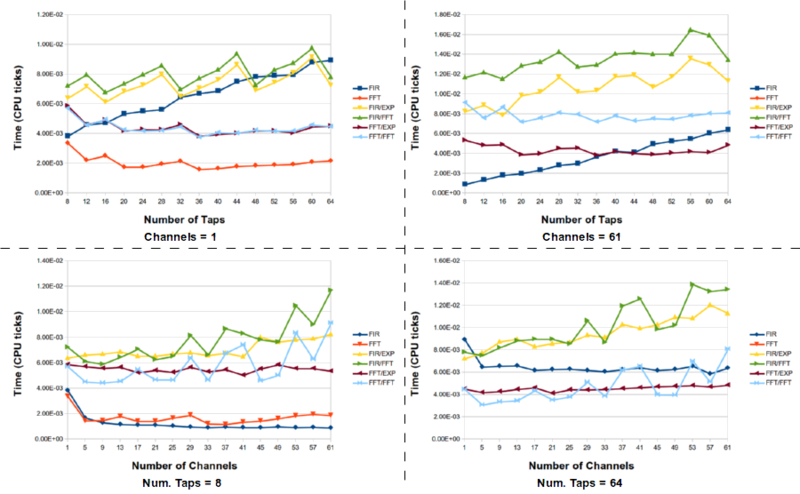 One question that came to mind after collecting the data and looking at it is what optimizations FFTW might have in it. I know it does a lot of SIMD optimization, but I also remember a time when the default binary install (via Ubuntu apt-get) did not take advantage of AVX processors. Instead, I would have to recompile FFTW with AVX turned on, which might also make a difference since many of the blocks in GNU Radio use VOLK for SIMD optimization, including AVX that my processor supports. That might change things somewhat. But the important thing to look at here are not absolute numbers but general trends and trying to get a feeling for what's the best for your given scenario and hardware. Because these can change, I provided the scripts in this post so that anyone else can use them to experiment with, too. We recently fixed a bug in GNU Radio where the rectangular window actually didn't work. It would fall through to the Hamming window because of a missing 'break' statement. Embarrassing bug, but not all that detrimental since the rectangular window is so rarely used. The one place it was being used was in the Hilbert transform block. We can build Hilbert transform filters using the filter.firdes.hilbert function. In this way, we've been able to set the window type to anything we'd like (Hamming, Hann, Blackman, etc.). But with the Hilbert transform block (that is, filter.hilbert_fc), we could only ever specify the number of taps to use in the transform and the window would default to a rectangular window -- except, as noted above, it would actually default to the Hamming window. So we decided to add another argument when creating a Hilbert transform block that allows us to set whatever window we wanted and not force a decision on the users. To keep the API sane, though, I wanted to make sure there was a good default for this, which brought up the question: what is the right default window for a Hilbert transform? That question depends a bit on who you ask. Johnathan Corgan mostly uses the Hilbert as a way to suppress sidebands while I tend to use it to convert real signals to analytic signals. These have slightly different properties, and the window used can help determine this (a few dB here and there). And while we have a decent understanding of these effects, I didn't really have a gut feel for which window was the right for any given course of action. So I played with it. I created a GNU Radio flowgraph that runs a noisy (real) sine wave through Hilbert transforms with different windows and plotted the resulting PSD on the same graph. The first image you see below is the full two-sided spectrum. 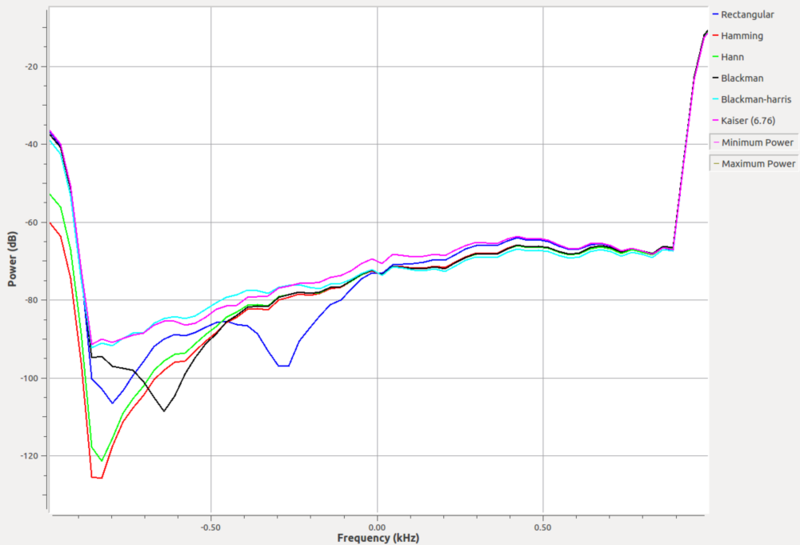 You can easily see how each of the windows has different attenuation in the negative frequencies. If we're trying to make an analytic signal, we want to remove as much of the negative frequency as possible to make the signal's real and imaginary parts as near orthogonal as we can. Looks like the Blackman-harris window is the best for this. 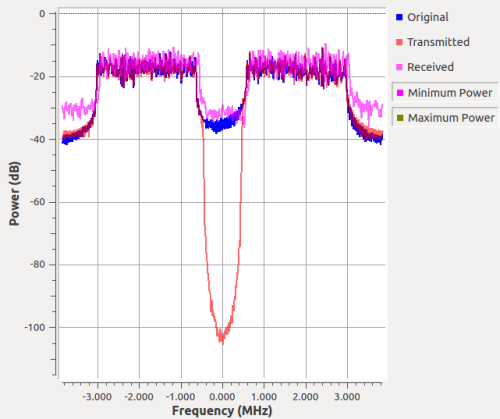 But for sideband suppression, we want to minimize signals near 0 Hz as much and as quickly as possible. Below are two zoomed-in looks at this graph. 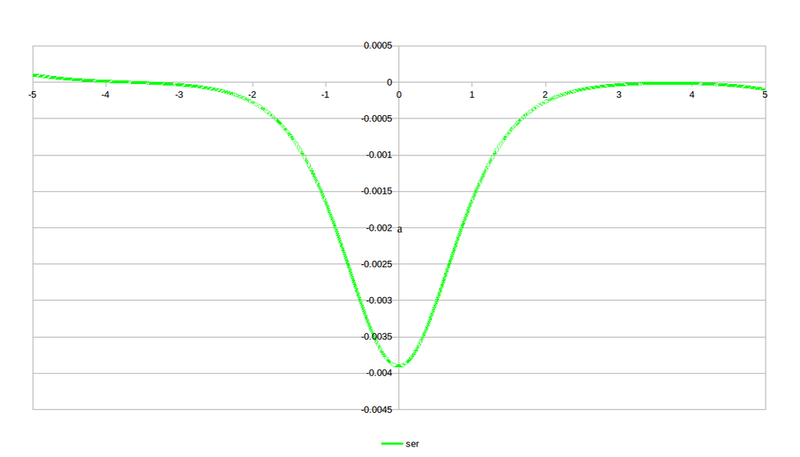 The first is right around 0 Hz and the second is offset a little so we can see the negative image of the 1 kHz sine wave. From these images, the Hamming window produces the fastest overall roll-off, even if it doesn't get quite as low as the Blackman-harris window does for full negative frequency rejection. On the other hand, the Hann window looks like it's the best compromise solution. I find these plots to be generally helpful in giving me a basic understanding for what I'm trading off with the different windows, and so I wanted to provide them here, too. As for the right default? Well, we have always been using the Hamming window, and it provides the best sideband suppression results. So we're going to stick with it as the default window so we don't change the behavior of existing GNU Radio projects that use the Hilbert transform block. The upside is that now we can select the right window for our needs if the default isn't suitable. Chris Sylvain found a bug with the Kaiser window. I fixed it and another bug in the Blackman window today. Here are some images of this program being run again after the fixes. Changes how they behave pretty dramatically. I'm really pleased to once again be serving on the Technical Program Committee for the upcoming IEEE DySPAN conference. They have announced the call for papers, due Nov. 1, and are starting to get the program up and going. Now, if you've talked to me about DySPAN as a conference, I've been somewhat critical of it in the recent years. Partly, it seems to have lost a bit of relevancy as the regulators have dictated how DSA was going to happen. For a couple of years, this suppressed a lot of innovative though in the conference. I recall that it was either in Singapore or Aachen when any spectrum sensing paper was immediately attacked for being irrelevant because the regulators were going database-driven. To me that felt like it lacked real foresight and creativity. 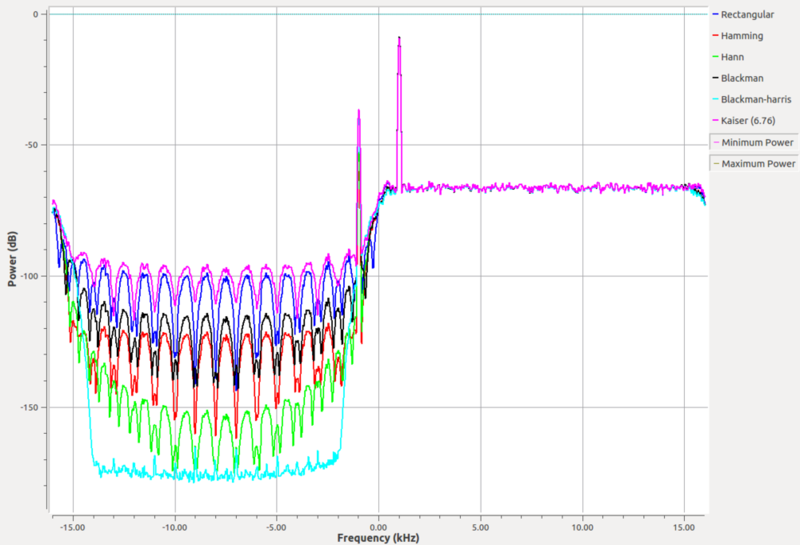 At the same time, I was also getting upset with the quality of the papers that I was seeing on spectrum sensing. My favorite way to describe the problem is that if you threw in the all sensing papers since the original DySPAN into a pile and pulled one at random, you wouldn't be able to tell which year it was published. Now, this probably isn't actually true, but having been involved with the community since the first DySPAN in 2005, I've seen that it's more true than not. I think the main reason for this problem is that we aren't setting up our work in a way that promotes the scientific process, and so each paper sets itself up as a new, or "novel" as the papers always say, way of doing spectrum sensing. We aren't doing much in the way of comparing techniques, building off other good ideas, or even finding fault in other approaches. It's all about the new novel approach that I would simply title a YASST: yet another spectrum sensing technique. My other major criticism of the conference is that we haven't quite successfully integrated the policy and technical people like the conference was supposed to. The DySPAN problem is much, much bigger than technical problems, and so the conference was established to address all (or at least many) of the challenge areas. Part of that idea is to allow multiple sides to understand each other and build collaborative, multi-disciplinary approaches (and by multi-disciplinary, I don't mean an engineer working with a mathematician). Instead, I've felt like, save some very specific people that I can think of (and they mostly come out of Dublin), both sides just live in silos with very little mixing. But, we have a new DySPAN coming up, and I've just read the briefing on the call for papers, posters, demos, and tutorials. The committee has put together the workings of an innovation-driven program. A lot of this I attribute to the very strong team they have put together who are interested and knowledgeable about both the research space and the current technology capabilities and trends. And yes, admittedly, a few of them are good friends, so. But specifically, a lot of these are among those (non-Dubliners, actually) that have an understanding and appreciation for the social, political, and economics of DSA aside from just the technical. So given what I'm seeing, I think we're going to see a really interesting conference with a lot of strong ideas. Now, having said all of this, I admit to having been part of the problem of the culture of DySPAN in the past. While reviewing papers on the TPC, I've tried to do my part to help foster as strong a program of papers that I could. But on the other hand, when I've attended the conferences, I, like most engineers, went in and only saw the technical presentations with maybe one or two presentations from the policy track. I expect that I'll be going to this DySPAN, and my goal this time will be to focus on those policy tracks and learn as much about that area as possible. 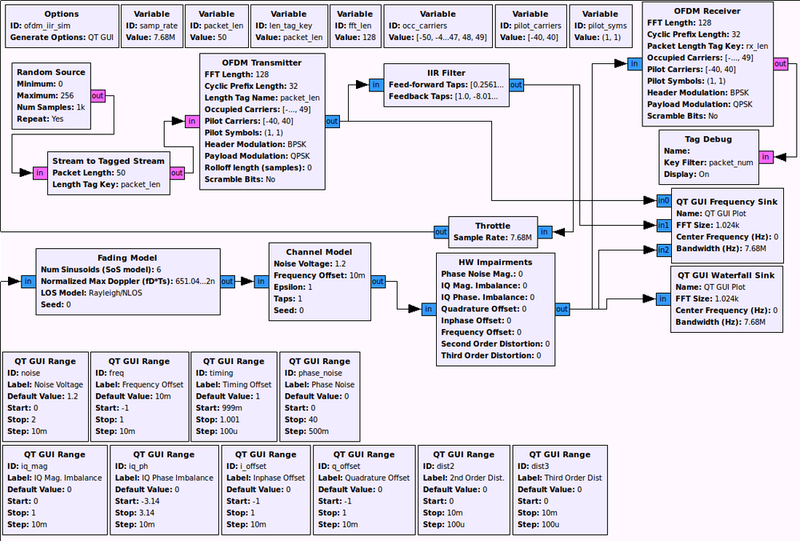 The most important and distinguishing piece of GNU Radio is the underlying scheduler and framework for implementing and connecting the signal processing blocks. While there are many other libraries of DSP blocks available, it's GNU Radio's scheduler that provides a common, fast, and robust platform to research, develop, and share new ideas. On the other hand, the scheduler is the most mysterious and complicated part of the GNU Radio code base. We often warn when people start talking about modifying the scheduler that, to use the cliche, "There be dragons!" Since the scheduler is so complicated and any change (and therefore bug) introduced to it will affect everything else, we have to be careful with what we do inside of it. Still, we may want to add new features, improvements, or changes to the scheduler, and do to so, we need to understand the entire scheduler to make sure that our changes fit and don't cause problems elsewhere. The scheduler has a number of responsibilities, and within each responsibility, there are checks, balances, and performance issues to consider. But we've never really documented the code, and only a few people have gone in and really analyzed and understood the scheduler. So I've gone about creating this presentation to try to break down the scheduler into its pieces to help improve the overall understanding of what goes on inside. Hopefully, this will demystify it to some extent. Most of my time these past few months has been taken up almost completely with the preparations for releasing 3.7 of GNU Radio. It's a huge task and has needed a lot of work and careful scrutiny. But I managed to find some time today to look into a question that's been bugging me for a bit now. A few months ago, we introduced the Performance Counters into GNU Radio. These are a way of internally probing statistics about the running radio system. We have currently defined 5 PCs for the GNU Radio blocks, and each time a block's work function is called, the instantaneous, average, and variance of all five PCs are calculated and stored. 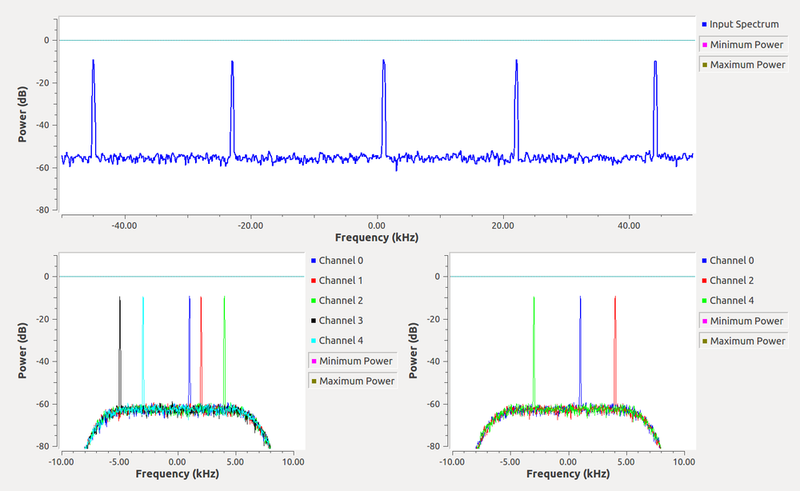 The PCs are really useful for performance analysis of the radio, possibly even leading to an understanding of how to dynamically adjust the flowgraph to alleviate performance issues. But the question that keeps coming up is, "what is the performance cost of calculating the performance counters?" So I sat down to figure that out, along with a little side project I was also interested in. My methodology was just to create a simple, finite flowgraph that would take some time to process. I would then compare the run time of the flowgraph with the performance counters disabled at compile time, disabled at runtime, and enabled. Disabling at compile time uses #ifdef statements to remove the calls from the scheduler completely, so it's like the PCs aren't there at all (in fact, they aren't). Disabling at runtime means that the PCs are compiled into GNU Radio but they can be disabled with a configuration file or environmental variable. This means we do a simple runtime if() check on this configuration value to determine if we calculate the counters or not. The hypothesis here is that disabling at compile time is the baseline control where we add no extra computation. Compiling them in but turning them off at runtime through the config file will take a small hit because of the extra time to perform the if check. Finally, actually computing the PCs will take the most amount of time to run the flowgraph because of the all of the calculations required for the three statistics of each of the 5 PCs for every block. 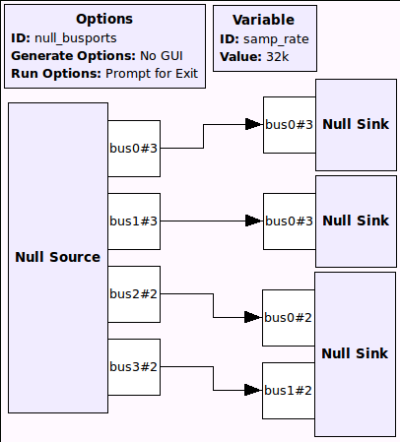 It sets up a null source and sink and a filter of some arbitrary taps and some length. The flowgraph is run for N items (1 billion here). I then just used the Linux time command to run and time the flowgraph. I then keep the real time for each of 10 runs. The results were just about as predicted, but also somewhat surprising, but in a good way. As predicted, having the PCs compiled out of the scheduler was in fact the fastest. If we look only at the minimum run times out of the 10, then turning the PCs off at runtime was the next fastest, and doing the computations was the slowest. But what's nice to see here is that we're talking much less than 1% difference in speed. Somewhat surprisingly, though, on average and looking at the max values, the runtime disabling performed worse than enabling the PCs. I can only gather that there was some poor branch prediction going on here. Whatever the reasons for all of this, the take-away is clear: the Performance Counters barely impact the performance of a flowgraph. At least for small graphs. But if we're calculating the PCs on all blocks all the time, what happens when we increase the number of blocks in the flowgraph? I'll address that in a second. First, I wanted to look at what we can do with the thread affinity concept also recently introduced. I have an 8-core machine and the source, sink, and head block take very little processing power. So I pushed all of those onto one core and gave the FIR filter its own core to use. All of the PC tests were done setting this thread affinity. So then I turned the thread affinity off while computing the compile-time disabled experiments. The results are fairly shocking. We see a decrease in the speed of this flowgraph of around 13%! Just by forcing the OS to keep the threads locked to a specific core. We still need to study this more, such as what happens when we have more blocks than cores as well as how best to map the blocks to the cores, but the evidence here of it's benefits is pretty exciting. Now, back to the many-block problem. For this, I will generate 20 FIR filters, each with different taps (so we can't have cache hiding issues). For this, because we have more blocks than I have cores, I'm not going to study the thread affinity concept. I'll save that for later. Also, I reduced N to 100 million to save a bit of time since the results are being pretty consistent. These results show us that even for a fairly complex flowgraph with over 20 blocks, the performance penalty is around a half a percent to close to a percent in the worst case. My takeaway from this is that we are probably being a bit over-zealous by having both the compile-time and run-time configuration of the performance counters. It also looks as though the runtime toggle of the PCs on and off seems to almost hurt more than it helps. This might make me change the defaults to have the PCs enabled at compile time by default instead of being disabled. For users who want to get that half a percent more efficiency in their graph, they can go through the trouble of disabling it manually.